First things first, the letter Q is silent in Maltese, so this area is actually pronounced OW-rah. It includes the peninsula where the Malta National Aquarium is located all the way back to the salt pans until the coast road. The area is primarily for tourists and residents, with several large hotels along the water offering tourists a waterfront spot with on-site restaurants, bars, pools, and activities. Unlike in Bugibba where Bugibba Square was a planned neighborhood common space, there is no central common area in Qawra. But the promenade all along the coast offers a beautiful space to walk, exercise, people-watch, or just take in the lovely views. The walk from Bugibba to Qawra can be done all along the seaside promenade for a couple of kilometers. Palm trees line the sidewalk in several parts and rocky coastline provides a beautiful foreground to the hues of blue in the Mediterranean Sea beyond. Bright white sailboats and powerboats fill the spaces in between. The colors here are vibrant and contrasting in every direction. From Bugibba until the Malta National Aquarium and then again in Salini National Park, there are several spots with exercise equipment and benches for sitting and taking in the views. Whatever your desired level of activity, there’s somewhere to stop along the way. After the Aquarium is the fortress, where you can walk down to the main swimming areas of Qawra. During the week you’ll spot lots of scuba divers heading out from this spot, while the weekends are busy for families and groups of friends taking in the sea air and enjoying a refreshing dip in the sea. A swimming area is blocked off from boat traffic during the summer, but those marker buoys weren’t there earlier in the year, so just be aware of boats in the harbor if there are no buoys! Walking back up to the promenade, you’ll pass by the Reggae Bar with its music echoing out along the rocky shore. It’s a hugely popular spot on weekends especially. Heading further along, the promenade follows the harbor filled with fishing boats, powerboats, sailboats, catamarans, jet skis, and more. Swimming areas all along the shore are filled with tourists and locals alike. Large hotels on the land side of the street offer views over the harbor; their restaurants, bars, and activity areas are all across the street right on the water. Most have dive shops on-site, plus pools and lounge areas and other water activity rental options. If you’re up for a long walk, keep going along the shore until you reach a park area – it’s the Salini National Park and is a lovely spot that feels a world apart! Malta is an arid place, so trees and green spaces are not at all common here. Even the palm trees fry and turn brown as the summer heat takes over. In Salini National Park, you’ll find lots of trees and shrubs – although in summer they, too, are fairly crispy. Pathways lead you around the park area overlooking the salt pans below. That’s where they used to harvest salt for commercial sales. It’s not currently in use but the pans are still visible…and smell-able most days, too! Think sulfur and just plug your nose if the breeze is blowing this way! As you reach the bottom of the park area, you’ll come across the reason this part is named Kennedy Grove. That’s right, a monument to an American in Malta in a prominent park…I just can’t escape my roots! There are tons of play areas for kids around here, as well as benches all around the fountains and along the tree-lined paths. On a weekend day, families are out enjoying time together and lots of other people are walking about and having a chat on the benches. It’s a lovely community space for all! We spotted an abandoned wine picnic set up in the trees and there was also a massive birthday party at the entrance to the park. It was complete with characters in full dress leading kids in sing-alongs and dances. Those people just cannot get paid enough for their energy output! From the top of the park we headed back home through the neighborhood, which is decidedly less pretty, but it’s still home for now! Thanks for walking around Qawra with us! 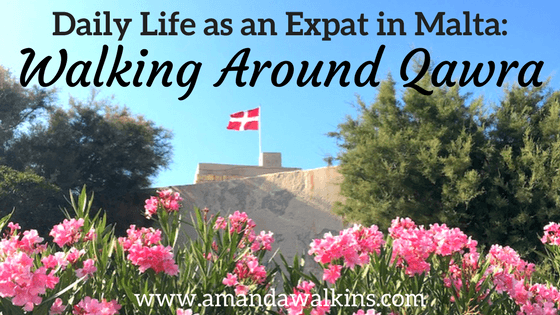 I hope you enjoyed this peek into our lives as expats here in Malta. You can follow our expat adventures by subscribing to my newsletter below, and follow me on social media, too! I’m on Facebook, Instagram, Twitter, and Pinterest.